The present text is a comprehensive textbook for various stakeholders engaged with hospitality industry especially rooms division. 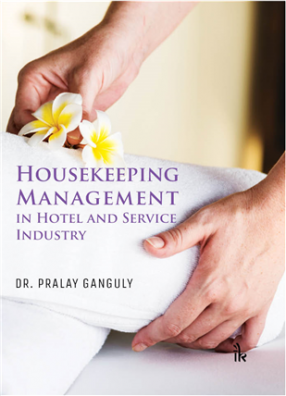 This book has a wide coverage of various courses of hospitality operations and management, namely, foundation course or short-term course in housekeeping, accommodation operations, advance course in rooms division, accommodation management with modern trends and provides up-to-date information about the accommodation sector. The book is divided into 19 chapters beginning with introduction to hotel, hospitality and housekeeping, spread in several chapters highlighting operational perspectives of rooms division and finally some chapters on accommodation management. Contents: 1. Hospitality, Hotel and Housekeeping. 2. Organization of Hotel and Housekeeping, Duties and Responsibilities. 3. Cleaning Organization. 4. Housekeeping Procedures and Routine Work. 5. Housekeeping Responsibility Area and Care-Composition of Different Surfaces. 6. Linen, Uniform and Tailor Room. 7. Laundry Operation and Stain Removal. 8. Interior Decoration. 9. Textiles. 10. Floor and Wall Covering. 11. Windows, Soft Furnishings and Guest Room Accessories. 12. Housekeeping Budget and Control. 13. Purchasing System. 14. Planning of a Guest Room. 15. Environmental Practices in Housekeeping. 16. Managing Housekeeping Personnel. 17. New Trends in Housekeeping. 18. New Property Operations. 19. Flower Arrangement. References. Glossary. Index.